Mix all the ingredients into the cream in a pan. Bring it gently to a simmer while stirring. Stir all the time. Pour it into another container when it has thickened. It prevents burning and lumping in the hot pot while you prepare the dough. Grease the mold and sprinkle it with flour so the tarts don't stick when baking. Cut the puff pastry into pieces that are approx. twice as big as your molds. Better too big than too small pieces. Nothing will go to waste anyway. Push the pastry well into the mold so there are no air holes. Cut off the excess dough and store it. Squeeze the cut-off dough into a balls and split it into approx. 1 oz (30 g) pieces. Press the pieces into the mold until they are bowl-shaped like the others. Sieve the custard so there are no lumps and cinnamon pieces left in it. 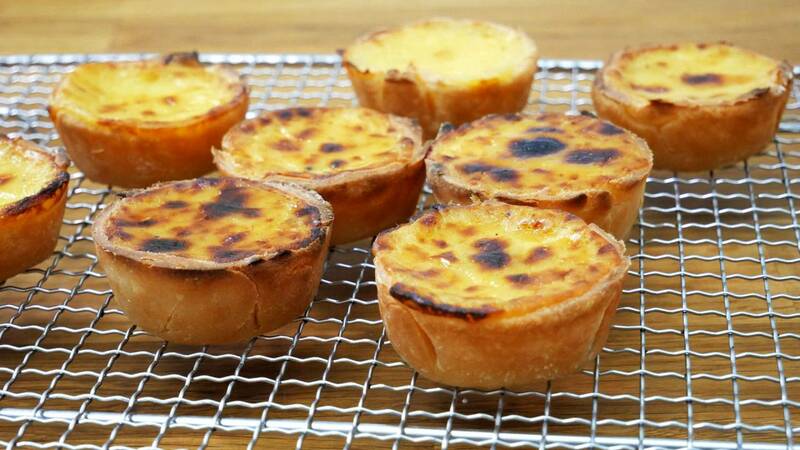 Pour 50 ml (½ dl (3 tbsp)) custard into each pastry bowl. Bake 15 min at 400°F (200°C) until they are golden and the cream bumps upward. Grill then for approx. 5 minutes until they get the characteristic dark spots. My cake mold has room for 12 pieces. Each shape is approx. 2 inches (5 cm) at the bottom and 3 inches (8 cm) at the top. They can accommodate a little bit less than 1/4 cup (1 dl (90 ml)).